On June 8, 2018, NEIN made their fourth consecutive yearly appearance on the Coors Light Rock On Stage at the San Diego County Fair. Fans came and enjoyed the energetic show put on by the band. I’ll tell you one more time! NEIN will once again kick off Jefferson Jay’s weekly open mic this Wednesday, February 28. Show starts at 6pm, be there for all the fun! 2017 was not quite as busy for NEIN as in the past two years but it was fruitful nonetheless. NEIN made it’s annual appearance at the San Diego County Fair as well as made their television debut on the local (San Diego) music showcase program “VV and Yourself Presents”. NEIN’s debut album N2.0 was reviewed in San Diego City Beat magazine during their annual “Great Demo Review” feature. The review was quite favorable towards the album. NEIN’s single “(I Wanna Incite A) Riot” was included on the local compilation disc “Staring at the Sun XII”, released on Blindspot Records. The album was compiled by local San Diego music legend Bart Mendoza, and the song received favorable reviews. Clifford and mikelewismusic represented the band at the release party held at the Casbah. NEIN once again graced the stage as the featured band at the weekly Open Mic hosted by the iconic Jefferson Jay at Winston’s in OB. NEIN played a powerful set to an appreciative audience. NEIN made two appearances on local radio podcast “Listen Local SD” hosted by Cathryn Beeks. On May 11 “Take that Girl” was featured, and on June 8 “Situation” was featured. NEIN made their television debut on the local music showcase program “VV and Yourself Presents”. This television show has been on the air for over 30 years and practically anyone who has made their mark in the San Diego music scene has appeared on the program – and now we can add NEIN to the list. The program showcased the dynamic talents of the band, and the director (Victoria Valentine, “VV”) and the crew all enjoyed the band’s presentation during the taping. In 2018 the band plans to make regular appearances at Winston’s and other venues, as well as secure gigs at the San Diego County Fair and December Nights. We’d like to thank all of our supporters and friends who bought the music, came to the gigs, wore the t-shirts, watched the videos, gave us pats on the back, and just plain supported us throughout the years – we truly appreciate you! We look forward to a great 2018 and invite you to come along for the ride. 2016 once again proved to be a fruitful year in the journey of the second iteration of NEIN! From a new album to triumphant performances, the band basked in the glow of a glorious year and look forward to capitalizing on this and moving onto bigger and better things. One item to note is that since the band reunited in January of 2015, this version of the band, affectionately dubbed “NEIN 2.0” has been together twice as long as the original incarnation from 1985! Here’s to many more fruitful years from everyone’s favorite aging punkers, NEIN! June 2016 – The Debut Album is Released! In May, NEIN entered the Grey Brick Recording Studio, under the helm of engineer Peter Duff, and laid down tracks for seven original songs. Coupled with the single “(I Wanna Incite A) Riot” recorded in November of 2015 (also at Grey Brick), a full-length album titled “N2.0” (short for NEIN 2.0, a moniker coined by drummer CHRIS CRIM! ), was released in July to rave reviews. N2.0 was NEIN’s first full-length album and also the first material released by NEIN since the 1985 single “Upside Down” b/w “Who Breaks a Wheel on a Butterfly”. In June, NEIN once again played the San Diego County Fair to an appreciative crowd. The gig preceded the release of N2.0 so the band was able to give the crowd a preview of the forthcoming album. In August, NEIN had a rip-roaring CD release party held at Winston’s Beach Club in Ocean Beach CA. The crowd thoroughly enjoyed the high-energy sets which (naturally) included selections from the album and also the single from 1985. The band also debuted their special “WhiteOut” uniforms including the new NEIN N2.0 t-shirts (which are available on request). L-R: mikelewismusic, Clifford, Leanne Pearl, Jefferson Jay, CHRIS CRIM! In May and November, NEIN entered Time Warner Studios to tape an episode of the local San Diego Music Showcase “VV and Yourself Presents”. It was a great experience, the episode is currently in production and we will announce (with trumpets and cornets singing!) as soon as it’s available on the air and YouTube. Selections from N2.0 were broadcast on the Internet Podcast “Listen Local San Diego”, a weekly radio program hosted by local artist Cathryn Beeks. On October 1, NEIN played at the Holy Family Festival to an appreciative crowd of fans, old and new. Also on the bill were the local band (and our friends) A New High. On December 2, NEIN played at Balboa Park’s December Nights. A video of the performance is currently in production, shot and edited by Alex Famous and will be available for viewing here once it is released. The band would like to thank everyone who came out to the shows, bought the CDs and t-shirts, those of you who took the time to listen to them online, and everyone who follows us here or on our Facebook page. We couldn’t do this without your love and support, we are grateful to everyone and here’s to a great 2017 from the guys in NEIN! For the second consecutive year, NEIN is proud to announce they will be playing at San Diego’s annual premier holiday event, Balboa Park December Nights, on Friday, December 2, at 4:30 at the Palisades Stage (located near the Hall of Champions). We hope to see all of our friends and fans there! 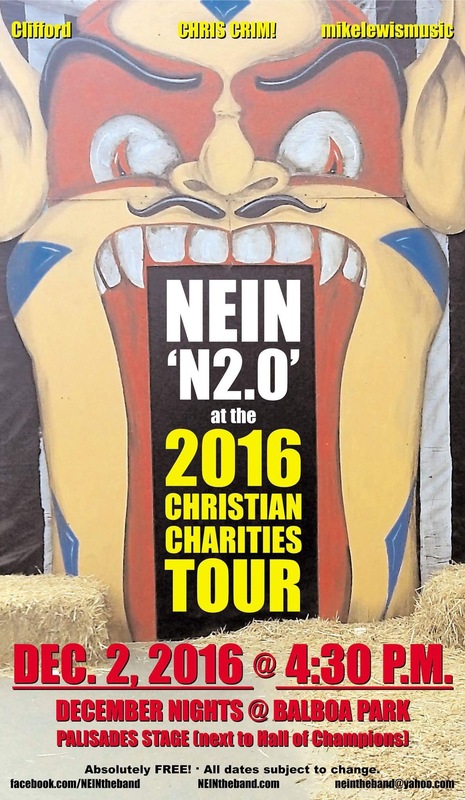 On October 1, NEIN made a triumphant return to Holy Family as part of their 2016 Christian Charities Tour. NEIN played a rousing one-hour set to an appreciative crowd of old and new fans. Also on the bill was local band (and our friends) A New High. Here are some great photos taken by staff photographer Tom Sneed, as well as some video footage from the show. The closing track to N2.0, “Is Anyone Wandering Around to Make it Rain?”, is featured on this week’s Listen Local San Diego Show. The appearance on the show promotes NEIN’s upcoming show at the Holy Family Festival on Saturday, October 1. Listen Local is a weekly podcast hosted by local radio personality/recording artist Cathryn Beeks. “Is Anyone Wandering Around to Make it Rain?” appears at 34:17 of the podcast.